Ramley House is a large two storied house faced in stucco with rusticated quoins. It has wide eaves and a hipped slate roof. The garden facade has a bowed centre with a ground floor loggia carried around the bow and finishing in a pediment at both ends. The east front has a very distinctive belvedere tower, which is reputed to have been the model for the one at Queen Victoria’s Osborne House on the Isle of Wight, built between 1845 and 1851. A later two storey wing has been added to the west end. The house is situated to the south of the New Forest in Hampshire. It is recorded as having been built in 1805, apparently for a prosperous Jamaican sugar merchant, however the first name to appear in the land tax returns is that of a widow, Charlotte Rose. She died in 1816, and the land tax returns for the next year refer to a ‘Mr Hunt’ living in the house. James Hunt paid £1 12s each year in Land Tax on Ramley House as late as 1831. However in 1832 the land tax was almost doubled to £2 9s. This suggests that James Hunt had added substantially to Ramley, especially as the land taxes of other properties in the surrounding areas remained unchanged. The tithe map for 1842 showed that the owner and occupier of Ramley House was still James Hunt, and that his landholding was forty-four acres, one rod and twenty-six perches, and he paid £2 5s 4d in tithes to the vicar. The house also had eleven fields attached, mostly in pasture and arable, but also with a small coppice, which is still known as Ramley Copse to this day, although no longer owned by Ramley House. In the 1851 census James Hunt gave his age as 84, and he shared the house with his unmarried daughters Martha (52), Harriot (43) and Maria (41). His son Walter was 39, and listed as a retired solicitor. There were also two domestic staff, Elizabeth Wareham and Hannah Smith. James died in 1852, and the house was sold by the trustees of Edward Hunt (perhaps another son), to Edward Lomer. William White’s History of Hampshire of 1878 describes Edward Lomer as ‘one of the principal landowners‘ of the parish. He also had a house in Brunswick Square, Southampton, which seems to have been his principal address. The 1861 census shows that Ramley House was let to William Warry, a native of Dorset. William lived at Ramley with his wife Ellen, and their children William and Mary. He also gave accommodation to his brother, John. The family had three resident staff. By 1871 Ramley was standing unoccupied. It may briefly have been let by the explorer and ornithologist Thomas Wright Blakiston, who grew up in nearby Lymington. 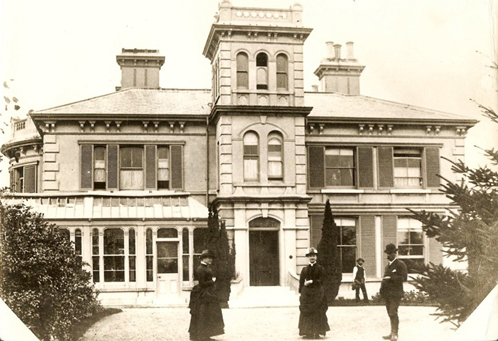 By 1881 certainly, Edward Lomer was living at Ramley again with his wife Sarah, and their children Ellen and Charles. The Lomers had four members of staff including a cook living at the house. Upon Edward’s death in 1895, Charles put the estate up for sale, where it was described as a ‘freehold residential sporting estate’. It now had two hundred and fifteen acres, and included Gordleton Farm and several cottages. In 1898 the purchasers appears to have been William Henry Jollands and Richard Evans. The Jollands also owned Upton Castle near Pembroke. At some point at the end of the nineteenth century, Ramley seems to have been re-modelled. The extension at the west end is believed to date from this time. Internally, the floating concrete staircase and skirting boards are reputed to have been installed by the builders of the Sway Tower nearby, which was constructed in 1879-1885. On 1 June 1905, Jollands sold Ramley to Lieutenant-General Thomas Wood M.P., who was also the owner of Gwernyfed Park in Breconshire. General Wood was a keen yachtsman and member of the Royal Yacht Squadron, Cowes. He lived in Ramley with his wife Maria, and their son William, who ran the estate. In 1922 the estate passed to Edward A Brown, of whom nothing is known. In 1935 the 213 acre estate was auctioned in three lots by Knight, Frank and Rutley. 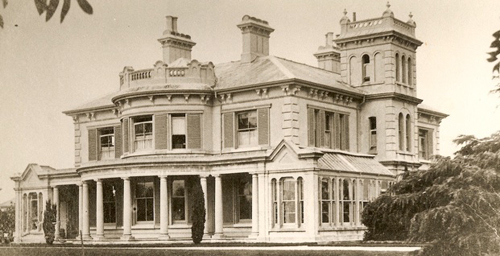 The purchaser of the house itself was Ernest Vaughan. Although he died in the early 1940’s his wife lived at the house for many years. 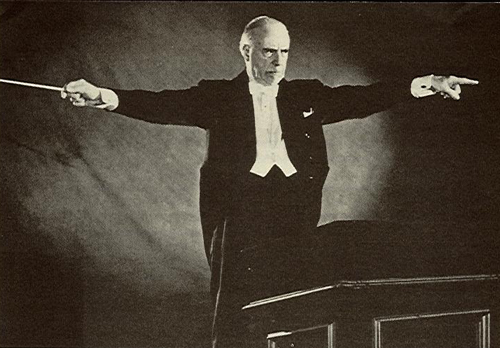 Mrs Vaughan sold the house to Sir Thomas Beecham, the famous wit, conductor, founder of the London Philharmonic Orchestra, the Royal Philharmonic, and artistic director of the Royal Opera House. 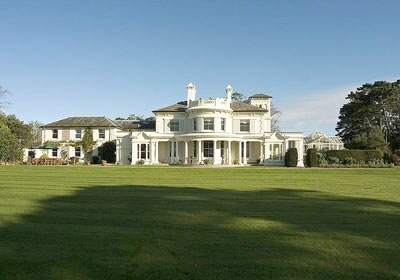 Sir Thomas seems to have used it as his country retreat rather than residing there permanently. In March 1958, before touring South America, he sold the house to the Spencer family who lived there for a number of years. Ramley House was put on the market in 1973, but does not appear to have changed hands until 1978, when it was bought by hoteliers. However when they were refused planning permission for an extension, they sold it on to Malcolm and Diana Thomas in 1979. Initially the house was run as a small country hotel, before being turned into a nursing home five years later. A serious fire in 1999 led to the closure of the nursing home and the house was sold in 2002. It was sold once more to the present owners in 2007. I was employed to work on paint colours for the interior. This has been taken from a website on the house.